That being said, you can imagine how hard it is to pack lunches. I pack things she likes, not what's necessarily healthy. A normal lunch would either include a Lunchable, or an Uncrustable. Even so, I'm pretty sure she tosses half of it in the trash, but there is no way for me to really tell. Time is also a issue when it comes to her lunches. When she gets to the cafeteria, and finally sits down, I believe she may only have 15-20 minutes to eat. Now to the normal person, that may be plenty of time, but Ashley usually takes at least a half an hour to eat her meals. I decided to look online (mainly Pinterest) to find things that would be yummy for her. It also has to be quick to put together. I have a husband to make lunch for, a baby to get ready for the day and Ashley's lunch; time is a valuable commodity. Here is a list of items I've found. I made the list for what I know Ashley will eat, hopefully it will work for your child(ren) as well. Peanut Butter Banana Sandwich - This seems easy enough. 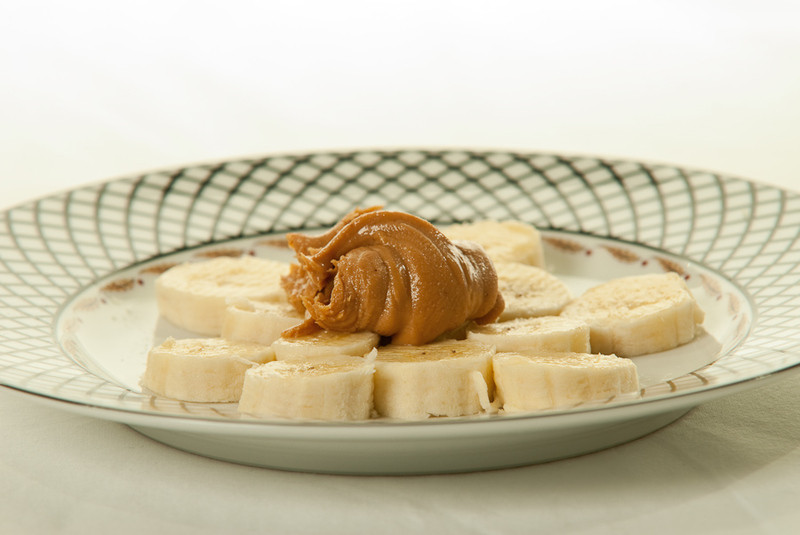 Slice a banana, add Peanut Butter, and put banana back together. Protein and fruit all in one! I just hope the banana doesn't brown too much or else she will not touch it. Fruit Kabob - She loves fruit. With this one I would either have to cut them all up on the weekend, or buy a platter to save time. 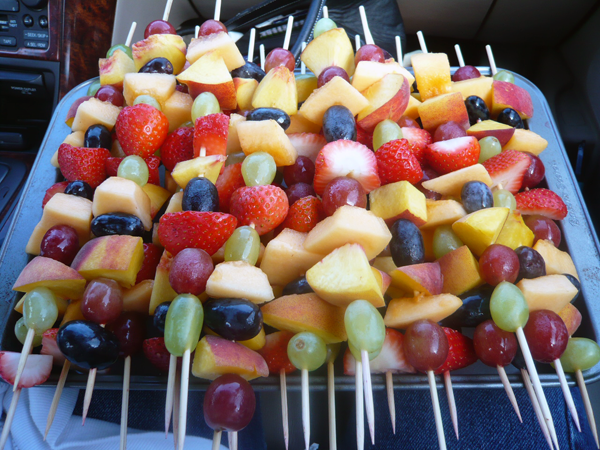 The morning of, I could easily stick the fruit on a kabob. Popcorn - Okay, so this one does not have much towards nutritional value. Ashley loves it though, and at least she wouldn't be filling up on something fattening. 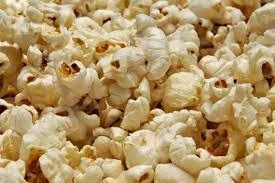 Popcorn is a very low calorie snack and she would love the surprise of finding this in her lunch box! 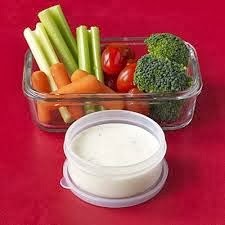 Veggies and Dip - I may be pushing it with this one, meaning Ashley may come home with a full lunch box. Lately she has been liking both carrots and broccoli with Ranch. I suppose I should take advantage of this and put it in as part of her lunch. Smoothies - I found this online and thought it was a great idea. 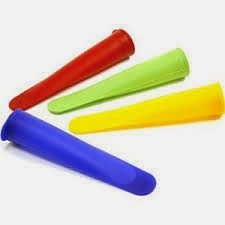 These are ice pop containers that you can buy on Amazon. Instead of making ice pops, though, you can premake smoothies and freeze them. 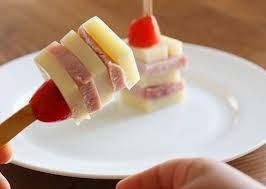 I'll have to play around with this though and find the perfect time to take them out of the freezer in the morning. I don't want her getting to school with either a hard smoothie she can't drink, or a warm one that doesn't taste good. Ashley LOVES smoothies though, so this would be great. I can only find six ideas that will, hopefully, work for Ashley. I would love to hear some other ideas that your kids may like!